If Dontnod proved anything with its first two games, it’s that the French studio has a strong command of theme and tone. From the sci-fi squalor of Remember Me to the indie film ambiance of Life is Strange, Dontnod creates fully realized spaces with practical design and a lived-in feel not commonly seen in videogames, and that are fully intertwined with the games’ stories and themes. And music, something that we clearly care a lot about here at Paste, is a crucial element to that world-building. Dontnod’s next game, Vampyr, comes out in early June. It’s set at a critical juncture for the 20th century world, right after the end of World War I, the conflict that fully unleashed the kind of mechanized widespread destruction that has come to define war. Still grappling with the aftermath of the war and the great upheaval of the Industrial Revolution, London(and the world are beset with a deadly pandemic of Spanish flu, which killed off tens of millions of people worldwide between 1918 and 1920. It’s an era steeped in death, trying to return to the stability of a past that would never return, and preparing to see an explosion in technological advancement that would change life forever. In that world Vampyr sets Dr. Jonathan Reid, a newly-turned vampire trying to save lives while feeding his own unnatural hunger. To help tell Reid’s story, composer Olivier Derivière (who worked on Remember Me, Assassin’s Creed IV: Black Flag—Freedom Cry and other games) focused on that intersection of past and future. He composed a classical and electronic score for the game, echoing the technological changes wrought by the Industrial Revolution, while enrolling cellist Eric-Maria Couturier to perform motifs that represent the humanity that’s fading away from both this new world and from the freshly undead Dr. Reid. 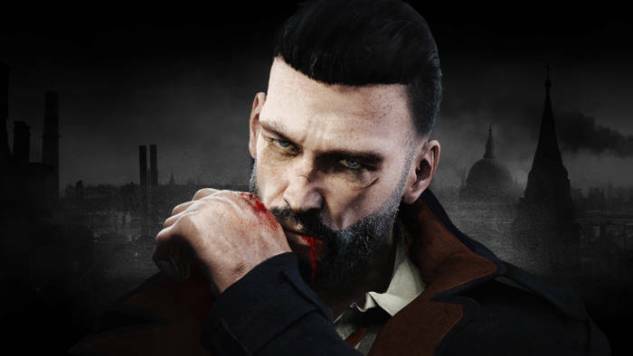 We haven’t had a chance to play Vampyr yet, but from what we’ve seen at various press events and in the game’s trailers, Derivière’s concocted a distinctive score that evocatively portrays the conflicts faced by both the London of 1918 and Dr. Jonathan Reid. That impression is supported by the video below, which Dontnod released today, and in which Derivière and Couturier discuss the writing and recording of the game’s score. And if you want to hear the soundtrack in full, it’ll be available on Derivière’s Bandcamp tomorrow, May 3. It’ll arrive on other streaming services on June 5, which is the game’s release date. If you like what you hear, and want to grip it on vinyl, you can also preorder a limited edition record with a portion of the soundtrack here, although there’s a catch: you pretty much have to be in continental Europe or Australia to get a copy.